as the diagnosis and treatment of such diseases. often with medication and/or surgery. 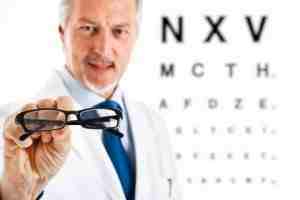 Unlike ophthalmologists, optometrists do not have an MD (medical doctor degree). corrective eye wear (e.g., eyeglasses). HOW DOES SOMEONE BECOME AN OPHTHALMOLOGIST? WHAT IS A BOARD CERTIFIED OPHTHALMOLOGIST? the highest level of education possible in this field. WHAT ELSE IS AN OPHTHALMOLOGIST CALLED? An ophthalmologist is also known as an oculist. WHAT IS THE ORIGIN OF THE WORD, OPHTHALMOLOGIST? Ophthalmologist comes from the Greek word "opthalmos" meaning "eye," and the Greek word "logos"
meaning "the study of." Put the two words together and you have "the study of (the) eye."